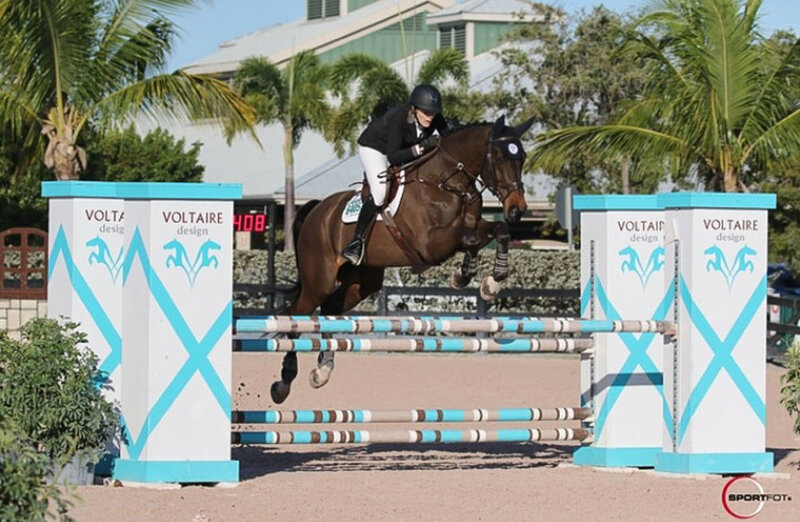 On the final day of the 2019 Winter Equestrian Festival (WEF), Sunday, March 31, the top 25 hunter combinations returned to the Derby Field at Equestrian Village to vie for the winning honors in the $50,000 USHJA International Hunter Derby. Victoria Colvin led the all-female podium positions followed by Kelley Farmer in second and Liza Boyd in third, as the trio once again demonstrated why they are household names in the hunter industry. The second round of the derby was the pinnacle event for hunter riders to close out the winter circuit and only invited the top-scoring competitors from round one of the event. Ken Krome once again designed a beautiful track on the turf that included three high options and a rollback to a trot fence following fence two. The two panels of judges, consisting of Danny Robertshaw and Robert Crandall for panel one and Scott Williamson and Rob Bielefeld for panel two, had the ability to award extra points for handiness ranging from zero to 10. Jacob Pope shot to the top of the leaderboard midway through the class with a second round total of 200.00 points and held the lead until veteran hunter rider Liza Boyd piloted Tradition to the lead. Pope’s combined score of 375.00 points was still enough to maintain the fourth place with Forget Me Not Farm’s Unbelievable. Boyd and Maggie Hill’s 8-year-old Westphalian gelding Tradition (Cornet’s Stern x Larix) accumulated an impressive second round score of 196.50 points and rounded out the top three after a combined score of 376.50. “This horse did win in Friday’s $15,000 USHJA International Derby Hunt & Go, because Tori and Kelley didn’t show,” Boyd teased. “In all seriousness, he did really perform well, and this is his third time being in the top three of a very competitive class. 1 El Primero / Victoria Colvin / Meralex Farm, Inc.
Special thanks to Jennifer Wood Media, Inc., for the press release. Posted on April 1, 2019 by Tricia Booker. Liza Boyd, of Camden, South Carolina, and Tradition were victorious in the final week of the 2019 Winter Equestrian Festival (WEF), as the pair captured the $15,000 USHJA International Hunter Derby Hunt & Go on Friday, March 29, at Equestrian Village at Palm Beach International Equestrian Center. The “Hunt & Go” derby was one of three major events for hunter riders during Week 12. Hunter derby competitors once again will get a chance at a change of venue as all hunter derbies for the week are being held on the Derby Field at Equestrian Village. Thirty-five horse-and-rider combinations contested Ken Krome’s course, which was designed in the newer Hunt & Go format, on the grass. The Hunt & Go format was only introduced several years ago as a way to shorten the original derby format while still offering a Classic and a Handy round. Instead of all riders competing through the Classic and then returning at a later time for a Handy, the course is designed as half Cassic and half Handy. Riders are therefore able to highlight their horse’s strengths in both formats. Krome’s course consisted of four high option fences, a trot fence, and a “bounce” line in the Handy portion of the course. Judges panels included Otis Brown and Ann Braswell in panel one, and Robert Crandall and Rob Bielefeld in panel two. Kelley Farmer and Larry Glefke/Aizlynn Radwanski’s Closing Statement were the first pair to head into the ring and took the early lead with a combined score of 333.00 points. She and the 6-year-old warmblood gelding (Mr. Blue x Ursula) finished in the fourth place position. As the 17th entry into the ring, hunter veteran Liza Boyd piloted Maggie Hill’s Tradition to the new lead after totaling 357.00 points with a Classic score of 179.00 and a Handy round producing 178.00 points. Boyd and the 8-year-old Westphalian gelding (Cornet’s Stern x Larix) are no strangers to success in the derby classes as Tradition’s second time in a derby was at the 2018 USHJA International Hunter Derby Championships, where he placed third. Boyd plans to compete the gelding in the weekend’s $50,000 USHJA International Hunter Derby but said she enjoyed being able to use the Hunt & Go format as a way to introduce her horse to his surroundings. Special thanks to Jennifer Wood Media, Inc. for the press release. Posted on March 29, 2019 by Tricia Booker. Special thanks to the Winter Equestrian Festival for featuring Liza Towell Boyd and Finally Farm in the “My Story” series! Posted on March 9, 2019 by Tricia Booker. The Finally Farm team enjoyed two successful and fun weeks during WEF 7 and 8 and attended the Deeridge Derby in Wellington, Florida. Highlights included during Week 7 included Kelly Maloney’s impressive championship in the Don Little Masters Adult Amateur Jumpers with Condero 3. Kelly purchased Condero through Hardin Towell and trains with Hardin and his father, Jack Towell. The new partnership of Gigi Manigault and Major Key made their debut together with great success, earning fantastic ribbons in the 3’3” Junior Hunter, 16-17, section and the reserve championship. Ellen Addison and El Tindo put in gorgeous rounds in the older Adult Amateur Hunters, receiving excellent ribbons both days. Bridget Hallman’s hunters shined during Week 7, with Who’s It taking the 3’6” Green Hunter reserve championship with Liza in the irons. The pair won two over fences classes on the way to the tricolor. Bridget then took Who’s It’s reins and also captured a blue in the middle section of the Adult Amateur Hunters, for an excellent finish to their week. After earning ribbons in the Conformation Hunter section with Liza, Halston carried Bridget to two second places in the competitive Adult Amateur Hunter classes. Cassanto and Maggie Hill added yet another championship to their collection, taking the 3’6” Large Junior, 16-17, title. During the Deeridge Derby, Liza Boyd and Maggie Hill traveled over to nearby Deeridge Farm to compete on their gorgeous grass field. Maggie and O’Ryan started out strongly, placing eighth in the $2,500 USHJA International Welcome Stake. In the $50,000 USHJA International Hunter Derby, held on Saturday and Sunday, Liza and Maggie both qualified to compete in the Handy Round the following day. Liza and Maggie’s Tradition stood third going into the Handy Round, but an unfortunate rail kept them out of the overall ribbons. Maggie and O’Ryan also ticked a rail in the Handy Round but otherwise had a stellar round. During WEF 8, Vistano and Libbie Gordon earned great ribbons in the 3’6” Small Junior, 15 and under. In addition, Vistano captured the reserve championship in the 3’6” Performance Hunters with Liza. Maggie continues to solidify her partnership with new equitation mount Eclipse, and the pair placed second in the WIHS overall out of 63 competitors. Libbie Gordon topped the Medium/Large Green Pony Hunter section with Haribo, taking two firsts and two seconds. Family time with Elle, Liza and Adeline! Please enjoy our fun photo gallery from WEF and Deeridge! Posted on March 7, 2019 by Tricia Booker. Finally Farm had a fantastic WCHR Week 6 on the Winter Equestrian Festival circuit, with top honors from the International Ring to Pony Island, from February 13-17. Highlights included Liza Boyd’s top-10 finishes aboard Maggie Hill’s Tradition (fourth) and Cassanto (eighth) in the $100,000 WCHR Peter Wetherill Palm Beach Hunter Spectacular, respectively. Liza also earned the week's Professional High-Score Award with a 92, and Tradition received the Charlie Weaver Memorial Award for the highest-scoring Conformation Hunter in Round 1 with an 86.66. In addition, Maggie earned a spot in the prestigious class on Saturday night by virtue of her Grand Junior Hunter and Small Junior Hunter, 16-17, championships aboard O’Ryan. She and O’Ryan won four of the five section classes and placed second in the other for the grand tile. The mother/daughter duo of Paige and Mckenzie Miller shared tricolor honors. Paige rode Shamrock to a reserve championship in the Low Adult Hunters, and Mckenzie and Otis Spunkmeyer captured the Crossrail Hunter (Younger) championship. The Finally Farm team concluded Week 6 with a star appearance in the 11th Annual Kids Lip Sync Show that benefits Danny and Ron’s Rescue. Elle and Adeline showed off their many talents and helped to raise money for a great cause! Please enjoy this gallery of images from WCHR Week 6! Posted on February 24, 2019 by Tricia Booker. The Children’s and Adult Hunters earned accolades during WEF 5, February 6-10 in Wellington, Florida. And Abigail Gordon and Delightful claimed their first Children’s Hunter, 14 and under, championship as a highlight of the week. “I want to thank the Barnett family and Joey Norick for sending the horse our way,” said trainer Liza Boyd. “He’s the greatest little horse. Jack said he could have sold him five times in the schooling area. He’s so wonderful,, especially for Abbie, who’s coming off of a pony. Paige Miller continued to forge a strong bond with her new mount, Shamrock, whom she purchased earlier in the circuit. The pair earned excellent ribbons in the Low Adult Hunters, including a third and fifth place over fences in a field of 34 competitors. Libbie Gordon and Vistano continued their solid performances in the 3’6” Small Junior, 15 and under, section, with top ribbons highlighted with a second place in the stake class. Maggie Hill and her new equitation mount Eclipse also added to their ribbon collection. They placed fifth out of 66 in the WIHS Overall and were fifth in the Jumper Phase, as well. Finally Farm is now gearing up for Week 6, which features WEF’s WCHR Week as well as the $100,000 WCHR Peter Wetherill Palm Beach Hunter Spectacular. Posted on February 13, 2019 by Tricia Booker. Liza Boyd and Maggie Hill continued their successful Winter Equestrian Festival Hunter performances during Week 4’s featured $15,000 USHJA International Hunter Derby “Hunt & Go”. Liza guided Maggie’s Tradition to third place overall, and Maggie made her debut in this class format with 11th place in the Classic phase. Liza was proud of Maggie’s skillful ride in the Hunt & Go, in which the first eight fences were jumped in the Classic format, and the remaining six fences were scored as a Handy. “She did a great job on O’Ryan,” said Liza. “She had high scores in the Classic part, but there was a tricky turn in the Handy, and you had to be cautious to hold the horse’s lead. You had to canter in between hay bales, and because of that (small mistake), she had an error at the next high option. Liza explained that the Hunt & Go format also requires a different strategy than the typical two-round USHJA International Hunter Derbies. In addition to earning championship honors with O’Ryan in the Small Juniors, Maggie also guided Cassanto to the reserve championship in the Large Junior, 16-17, section and received excellent ribbons aboard Tradition. Just after finishing in the Junior Hunters, Maggie ran over to the Medium Junior Jumpers for the $10,000 NAL Classic, where she had just one rail and made the time allowed aboard the mare, Hope. “She just moved up, so I’m really proud of her for that round. It was well done, and she’s fortunate to have Hardin (Liza’s brother) and Darragh Kenny to help her, in addition to Jack,” noted Liza. Gigi Manigault continued her excellent performances in the Low Children’s Jumpers with Cassiana, and Libbie competed her two mounts, Athletic Lady and Can-Do, in the High Children’s Jumpers. Liza’s daughter, Elle, had success aboard Blue Moon in the competitive Children’s Small/Medium Pony section. “She was second in the last class with 30 kids and is really working on learning to manage the canter,” said Liza. “In the last line coming home, she’s sometimes too fast. So we’re working on her slowing down before she makes the turn for the next corner. She’s immediately landing and getting the pony back to the rhythm. The Finally Farm team then wrapped up Week 4 with a barn Super Bowl party. Special thanks to the Hill family for hosting! Posted on February 4, 2019 by Tricia Booker. Despite the rainy conditions over the weekend during WEF Week 3, the Finally Farm horses and riders shined brightly, January 23-27 in Wellington, Florida. Bridget Hallman had a banner week with her horses, claiming a championships in the Adult Amateur Middle section aboard Who’s It. She guided the 9-year-old Selle Francais to victories in both over fences classes and second in the under saddle for a commanding win. In addition, Bridget piloted Halston to two third places over fences in the same section. The 7-year-old Holsteiner also earned excellent ribbons in the Green Conformation section with trainer Liza Boyd in the irons earlier in the week. Liza rode Maggie Hill’s Tradition to championship honors in the High Performance Working Hunters, including an impressive win in the Handy Hunter class. Maggie continued her own tricolor streak this week, earning the 3’6” Large Junior Hunter, 16-17 championship aboard Tradition, as well. Her Junior Hunters O’Ryan and Cassanto, tricolor winners in the previous two weeks, took some time off, and Tradition stepped right up to fill their shoes. Libbie Gordon and Vistano’s consistency paid off in the 3’6” Small Junior Hunters, as they earned a reserve championship with top ribbons in most every class. In addition, Libbie rode Tybee to impressive ribbons in the 3’6” Large Junior Hunters. “We added a new gentle giant to our barn,” said Libbie’s mother, Susanne, of the fancy chestnut Tybee. Posted on January 31, 2019 by Tricia Booker. 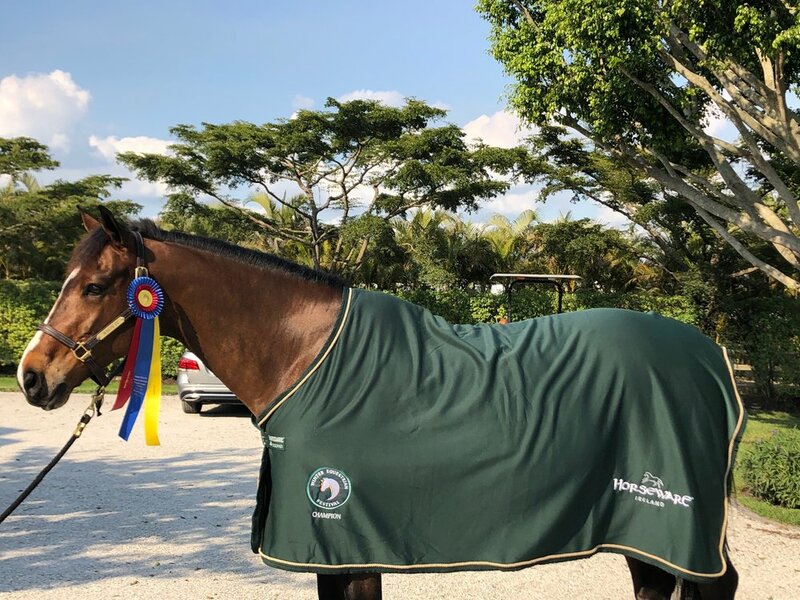 More ribbons were added to the Finally Farm banner during Week 2 of the Winter Equestrian Festival with more riders and horses joining in the fun, January 16-20 in Wellington, Florida. Clara Saad and El Paso continued to gain great mileage and top ribbons in Low Children’s Hunters. “Clara and El Paso tied for Reserve Champion in a huge division this weekend at WEF- only his second show in the States. I think he likes it here,” said Clara’s mom on her Facebook page. Paige Miller and Shamrock made their debut together in the Low Adult Hunters during Week 2. “It was a fun first show for them, and they’re a great match for the future,” said Liza. Maggie Hill had an exceptional show during WEF 2. In addition to claiming the 3’6” Small Junior Hunter, 16-17, tricolor with O’Ryan, Maggie guided Cassanto to excellent ribbons in the Large section and piloted Eclipse to top ribbons in the big equitation classes. 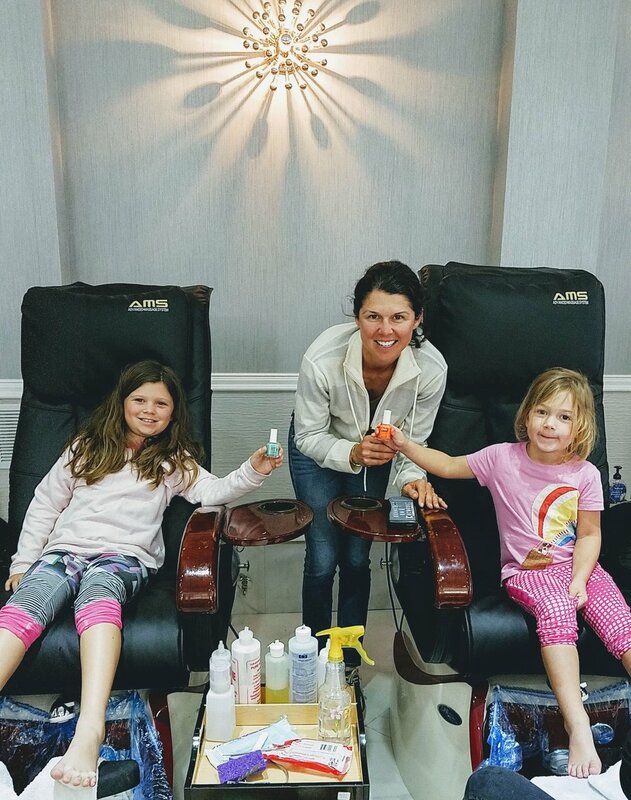 Monday “Fun Spa Day” with Elle, Liza and Adeline Boyd. Posted on January 22, 2019 by Tricia Booker. Finally Farm had a fantastic start to the 2019 Winter Equestrian Festival circuit with top prizes and tricolors in the Hunters, Jumpers and Equitation rings during Week 1, January 9-13. Bridget Hallman, of Oyster Bay, New York, made her WEF debut with her newest horse Who’s It a winning one—earning championship honors in the Adult Amateur Hunter, 36-49, B section with two firsts and a second. Bridget also captured top ribbons with her Halston in their first time together in the show ring. “This week was so exciting for Bridget. She rides them both so well, and Bridget and Who’s It are a great match,” said Liza. Barn manager Katie Wood noticed the 9-year-old Selle Francais (Lamm De Fetan—Kaline De Cantilly), last year in Tryon, North Carolina, during a ticketed warm-up class and suggested Liza check him out. Grand Prix rider Todd Minikus was transitioning the bay from the Jumpers to the Hunters. Liza also credited Bridget’s team, including Ivan Rakowsky and Jacob Pope, for helping to prepare Who’s It for WEF. Minikus also gave Bridget a flat lesson on Who’s It in preparation for the show season. Maggie Hill started her show season just where she left off last year—with tricolors. She guided O’Ryan to the Small Junior Hunter, 16-17, championship and Cassanto to the Large Junior Hunter, 16-17, title. Like Bridget, Maggie has also been settled in Florida for a while and has been riding a lot and training with Liza’s brother, Hardin Towell. Finally Farm welcomed Annika Singh from Medina, Washington, to the family during WEF 1. Annika is spending three weeks with the Towells from her home base with trainer Morgan Thomas in the Seattle area. Although it was Annika’s first foray to Florida, she wasn’t fazed by the cross-country journey and captured an Equitation, 15-17, championship out of 50 competitors in a California split. In the Children’s Jumpers, Ruby Sloan and Libertina jumped to fifth place in the Highs, while Gigi Manigault and Cassiana placed 11th in the Low Children’s Jumper Classic. Gigi also moved up to the 3’6” Large Juniors on Bastille and had solid performances. “We’re very excited that she’ll spend the circuit competing down here with these two wonderful horses,” said Liza. Liza’s daughter Elle Boyd made her WEF debut with Blue Moon in the Small Pony Hunters with impressive performances, including an eighth-placed ribbon over fences and ninth place in the classic. In addition, Elle is following in her mother’s footsteps and had her first-ever catch ride. She guided Delovely to second, fourth and fifth in the Children’s Pony Hunters. Finally Farm also congratulated Paige Miller on the purchase of Shamrock and wishes her the best of luck as she shows him next week in the Adult Amateur Hunters. Posted on January 14, 2019 by Tricia Booker.